Maximum performance for Threadripper™ and EPYC™ processors. 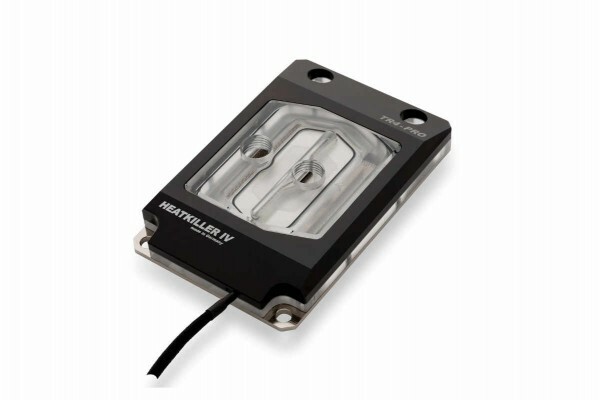 The HEATKILLER® IV PRO for Threadripper™ is a premium water block specifically designed for AMD® Threadripper™ processors. It's based on the multiple award-winning HEATKILLER® IV CPU water block series. The main feature of the block is the completely new cooling structure that is perfectly adjusted to the specific Threadripper™ package. Instead of simply extending the cold plate, we developed a completely new and unique water block. For example, the cooling structure is more than 80% larger than that of a regular HEATKILLER® IV PRO. Flow and bleeding characteristics were also optimized. All these features let the HEATKILLER® IV PRO for Threadripper™ block become a true performance monster! Mounting the block is extremely simple due to the revamped easy-mount-system. It comes with a defined stop, which guarantees perfect and even pressure over the whole IHS. The acryl nickel/black version comes with a pre-installed RGB LED strip. It is perfectly hidden under the black front cover. The strip connects to the LED header of the motherboard via a black paracord sleeved cable. The strip is compatible with ASRock's RGB LED, ASUS' AURA, GIGABYTE's AORUS FUSION and MSI's MYSTIC LIGHT. I have always admired the products from watercool.